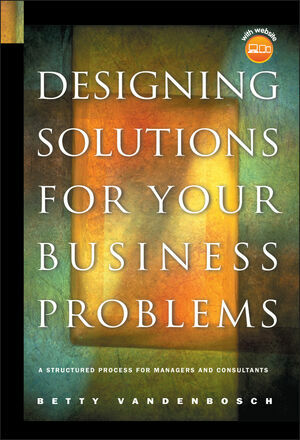 Designing Solutions for Your Business Problems is an essential resource for managers and consultants who help organizations resolve ambiguous problems and develop new opportunities. Taking a hands-on, practical approach, Betty Vandenbosch—a leading management consultant and educator—outlines the details on how to conduct a proven process for designing solutions. Designing Solutions for Your Business Problems will teach you how to curtail investigation and generate and justify ideas without sacrificing thoroughness, creativity, persuasiveness, and fit. You will be able to capitalize on more opportunities, and your problem-solving skills will become more efficient and your solutions more compelling. This book will help you design better solutions and design them faster. Betty Vandenbosch offers a variety of useful techniques such as the "scooping diagram," which provides a framework for action, and the "logic diagram," which tests the validity of a potential solution. In addition, the book contains illustrative real-life examples of the Designing Solutions approach from a variety of organizations. Betty Vandenbosch is associate professor of information systems at the Weatherhead School of Management at Case Western Reserve University. She is also a director of PDN Limited, a professional services development firm specializing in consultancy skills training. 2. What's the Point? Agreeing on the Objective. 9. If You Can't Choose, You Lose: Designing the Solution. 10. Who's Going to Do It? Driving Execution.